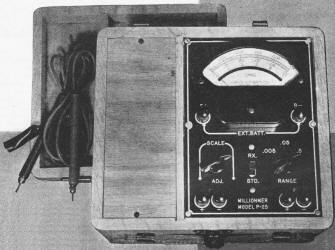 Commercially constructed ohmmeter. This instrument is highly portable and houses a precision standard resistance which is used as a companion when measuring an unknown resistance. A review of the various methods used in the measurement of resistance, from the simplest form to the more highly accurate laboratory methods. Examples are presented whenever their use is justified and formulas worked out so that anyone, with a small working knowledge of mathematics, can make accurate measurements. Accurate resistance measurements are an essential part of laboratory procedure. For some types of work, an accuracy of ±2% is adequate, while under other circumstances, much higher accuracy is necessary. This article discusses several methods of resistance measurement including the simple ohmmeter, the Wheatstone bridge, and the Kelvin bridge. Among the simplest methods that can be employed in the measurement of resistance is the so-called ammeter method. This method, illustrated in Fig. 1A, employs a source of potential, an ammeter or milliammeter, and the unknown resistance. Ohm's law states that R = E/I. Resistance is equal to the voltage impressed across a circuit divided by the current flowing through the circuit. If we employ a 1.5-volt cell as a source of potential and impress this voltage across an ammeter and unknown resistance in series, and the ammeter reads 0.2 ampere, the circuit resistance is 7.5 ohms. Note that 7.5 ohms is not the resistance of the unknown resistance, but is the resistance of the entire circuit (unknown resistance, ammeter, connecting wires and internal resistance of the cell). To determine the resistance of the resistor, it is necessary to deduct the ohmage of the ammeter, wires, and internal resistance of the cell from 7.5 ohm total. In order to obtain high accuracy in this method, several points must be borne in mind. 1. Use a large cell having low internal resistance (a storage battery is ideal). 2. Use large-diameter connecting wires having low resistance. 3. Use an ammeter having a very low resistance. 4. Know the resistance of the ammeter. 5. Be sure that the ammeter is accurate. For values of resistance above 10 times the resistance of the ammeter, the ammeter resistance, the connecting wires, and the internal resistance of the cell may be disregarded. The accuracy of the ammeter method can be further increased by employing a standard resistor and basing the calculations on this standard (Fig. 1B). x : 10 = 4:1; or the resistance of the unknown is 4 times the resistance of the standard, or 40 ohms. Note that now only the resistance of the standard need be known. Fig. 1. (A) Diagram illustrates ammeter method of measuring resistance. (B) Similar to that of (A) with the exception that a standard resistance is used as a comparison. (C) Diagram illustrates voltmeter method of resistance measurement. Fig. 2. - Commonly used ohmmeter. There are two versions of this particular type: (A) Series type: and (B) Shunt type. This is a very important formula and most commercial ohmmeters use this principle. The voltmeter method is simple and can be used to read higher resistances than the ammeter method. The main disadvantage of the voltmeter method is that the meter must be capable of close reading and its resistance must be known. The voltmeter method can also be used in conjunction with a standard resistance to improve its accuracy. It will be described later on under Laboratory Measurements, as it is capable of high precision. The common ohmmeter is a variation of the voltmeter method. There are two types of ohmmeters, the series type (Fig. 2A) and the shunt type (Fig. 2B). In the series type, a battery, a milliammeter, and a resistor are connected in series with the unknown resistor. The resistor is made variable so that the meter can be brought to full scale. As such, the resistor and the meter constitute a voltmeter which can be brought to full scale to correspond to the voltage of the battery. The value of the resistance required can be computed by Ohm's law. If a 1-ma. meter and a 4.5-volt battery are used, the series resistor would then be 4500 ohms. when R1 = meter resistance (as a voltmeter), R2 = unknown resistance. or 25 divisions on the 50-division scale. A 10,000-ohm resistor would read 16 divisions on the same scale, and a 500- ohm resistor would, in like manner, read 45 divisions. The above method is the method employed by the writer in calculating the resistance scales for one manufacturer in the instrument field. Fig. 3. - (A) Ohmmeter employing a zero adjusting control that is placed in shunt with the meter. (B) Commercial-type ohmmeter based on both the series and shunt circuits. In order to reduce the range of the meter, a shunt can be employed. By using a shunt to change the aforementioned 1-ma. meter to 10 ma. and reducing the series resistance to 450 ohms, a reduction ratio of 10 is brought and the center of the resistance scale then becomes 450 ohms. To increase the range of the ohmmeter, either a 45-volt battery and 45,000-ohm resistor can be employed with the 1-ma. meter, or the meter sensitivity can be increased 10 times to 100 microamperes. In the above ohmmeter, the resistor in series with the meter acts as a "zero adjuster control" to compensate for battery voltage changes. In multi-range instruments, this "zero adjuster control" must be made with a special taper so that it can be employed successfully to vary the meter on all ranges. It is often better to place the control across the meter and use a fixed series resistance. This is advantageous because the control has a much better adjustment in this position and the circuit can be proportional, so that no adjustment need be made when changing ranges. Fig. 3A shows such a circuit. The low range of the instrument is 0-5000 ohms, with 35 ohms center scale; and the high range is 0-500,000 ohms, with 3500 ohms center scale. The series type of ohmmeter is the most common type of ohmmeter in use today, its accuracy being normally 2% of the linear arc; i.e., if the arc of the meter is 90°, then all readings are accurate to 1:8° at any part of the scale. Although the series ohmmeter is often used for low resistance measurements, it has been deemed advisable to use another circuit in place of it. Referring back to the circuit of Fig. 3A, the low range consists of the 24- and 11-ohm resistors in series with the unknown and the 4.5-volt battery. If the unknown resistance is 10 ohms, a total of 45 ohms is in series with the battery. Neglecting the current used to actuate the meter, this means that a current of 100 ma. is being taken from the battery, and if used continually for low resistance testing, would exhaust the battery. To circumvent this, the shunt ohmmeter is used. 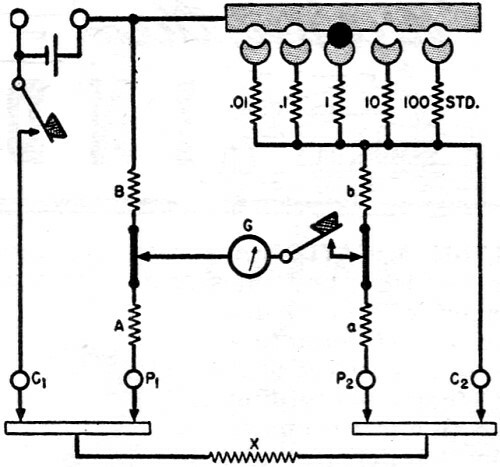 The shunt type (Figure 2B) is the series ohmmeter with the leads shorted and the resistance placed across the meter. The effect of the resistance in this position is to act as a shunt across the meter to reduce the scale reading. Since a short across the meter will cause the meter not to read at all, the zero point corresponds to the zero of a regular voltmeter, pointing to the left and the "infinity" mark to the right. 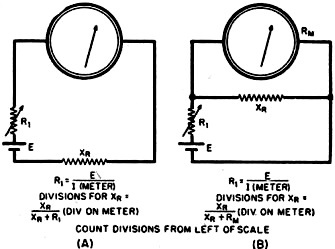 x divisions of the meter scale. Fig. 4. 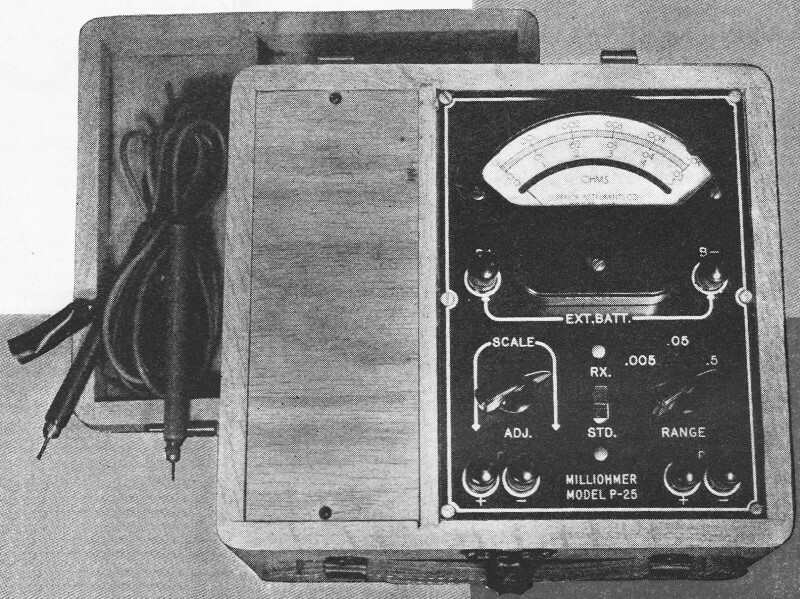 - Scale divisions of a commercially built ohmmeter. Superior Instruments Company's model 1552. Because of this fact, the resistance of the meter appears in the center of the scale. The shunt ohmmeter finds its chief use in measuring resistances less than 100 ohms. If the meter is to measure resistances less than 6 ohms, the length and resistance of the test-leads must be figured into the computation of the scale. A pair of commercial test-leads (36") has a resistance greater than 0.06 ohms. If the resistance were not taken into account when the scale of the meter was computed, an error of 1% would exist at the 6-ohm point. The error at 0.6 ohms would be 10%. If the resistance of the test-leads were added to the meter resistance, the error would be eliminated. A typical commercial ohmmeter employing both series and shunt circuit is diagrammed in Fig. 3B. This is a commercial ohmmeter manufactured by Superior Instruments Company, their model 1552. The scale of this instrument is shown in Fig. 4. The series ohmmeter is used for the high range of 0-1000 ohms and the shunt ohmmeter used for the low range 0-10 ohms. Note that the end of calibra­tion of the low resistance scale is not at the extreme left, but slightly before the end of the scale. 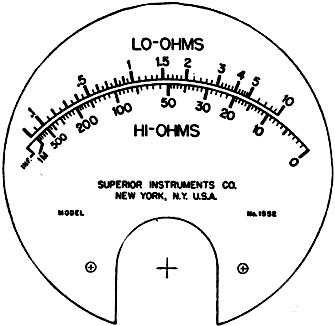 The zero point corresponds to the 0.06 ohm test-leads used with this instrument. Some commercial instruments omit the "zero adjuster" control by employing a magnetic shunt across the meter. This has the effect of increasing or decreasing the sensitivity. The above methods are commercial methods in use today and, unless extreme precautions are taken, cannot successfully be used to measure better than 2%. To achieve a higher degree of accuracy, laboratory methods must be used. Two general methods are employed in the laboratory: the potentiometer method and the bridge method. In the method employed, current is sent through both the standard resistance, usually having an accuracy of 0.05 % or better, and the unknown resistance. The voltage drop across the standard is read first, and then the drop across the unknown, by means of the potentiometer. If, for example, a standard resistance of 1 ohm is used and the voltage drop across it is found to be 1 volt, with the voltage drop across the unknown 1.016 volts, the unknown resistance is 1.016 ohms. This is true since the same current that passed through the two resistances makes their voltage drops proportionate to their resistances. A commercial instrument utilizing this principle, the model P-25, manu­factured by Superior Instruments Company, operates on the following principle: A current is sent through a precision standard resistance and the unknown. The voltage drop across the standard is adjusted until the meter reads full scale, by means of a control and a momentary "standardizing" switch. When the switch is released the drop across the unknown is read. Although the instrument really measures voltage drops, the scale is calibrated in ohms. The indicating instrument is a precision mirror-scale millivoltmeter, having 100 divisions. Range of the instrument 0 - 0.005, 0 - 0.05, 0 - 0.5, since it was made primarily to measure low resistances such as solid rods of metals, switch contacts, etc. The lowest reading possible is 0.00005 ohms with the limit of error 1 division or 1% at any part of the scale. Readings can be estimated to 1/4 division. Although this instrument was made primarily to measure low resistances, it can be converted to read high resistances by a small change in wiring. It should be especially noted that the scale of this and similar instruments operating on the same principle are linear, as compared with the crowded scales of ordinary resistance meters. The more common type of laboratory resistance meter is the bridge. There are two basic types of bridges: the wheatstone bridge, for measuring resistances above 0.1 ohm, and the Kelvin bridge, sometimes called a double bridge, for measuring resistances below 1 ohm. The accuracy of commercial laboratory Wheatstone bridges runs from 0.5 of 1% in portable models to 0.02 % in high precision models. 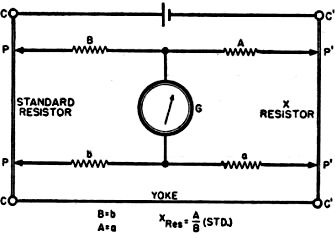 A variation of the Wheatstone bridge employs a slide wire in place of fixed ratio arms and a fixed resistance standard in place of the C arm. Although the accuracy of the slide-wire bridge is usually less than that of the fixed-ratio bridge, it has the advantage of greater speed in reading. Fig. 5. - Wheatstone bridge. Fig. 6. - Kelvin bridge. 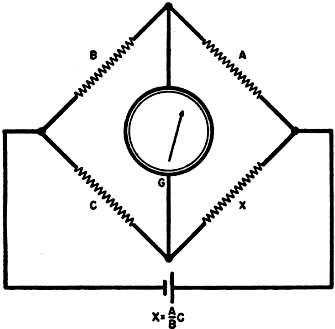 The Wheatstone bridge cannot be successfully used to measure low resistances. If we take a bar of metal and try to measure its resistance by means of a Wheatstone bridge, several important facts must be borne in mind. The resistance of the connecting leads must be accurately known, since they contribute to the resistance indicated by the bridge. Resistance of the contacts between the bar and the connecting wires must be known for the same reason. By employing large low-resistance cable as connectors, the former can be deducted from the bridge reading, but the latter (contact resistance) can never be accurately known. Because of this fact, the Wheatstone bridge is never used to measure below 0.1 ohm, although theoretically it is possible. In the Kelvin bridge, the resistance of the connecting leads and contacts are unimportant since they are put in series with the comparatively high-resistance ratio arms. This can be done only by employing current and potential terminals for both the standard and the unknown resistance. The resistance measured by the Kelvin bridge is the resistance between the potential leads only. Fig. 6 illustrates the operation of the Kelvin bridge. 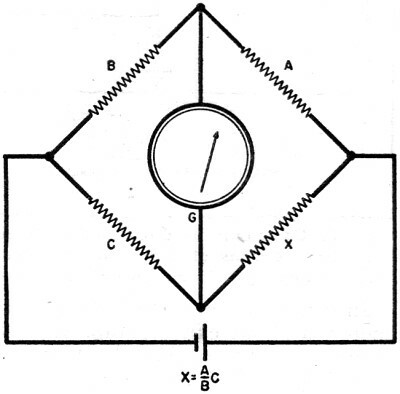 A and B: The regular ratio arms similar to those employed in a Wheatstone bridge. a and b: A duplicate set of ratio arms. Yoke: This is the connecting bar between the standard and the unknown. Note that a and b shunt the yoke and therefore its resistance does not enter into the calculation. C and C: The current connections of the standard resistance. C' and C': The current connections of the unknown. P and P: The potential leads of the standard. P' and P': The potential leads of the unknown. G: The galvanometer that is used to indicate when the bridge is balanced. Since all the heavy current goes through the current terminals (there is only a low circulating current flowing through the ratio arms) the contact resistance of the potential leads has no effect on the measured resistance. A commercial laboratory version of a high precision Kelvin bridge is that manufactured by the Leeds & Northrup Company and comprises two units, the 4320 dual ratio box and the 4300 low resistance standard. The dual ratio is made up of 10 resistors, two each of 100-300-400-1000 and 10,000 ohms. These coils are adjusted to better than 0.05 % of their nominal value. They are controlled by plugs and give ratios of 100, 10, 1, 0.1, and 0.01 of the standard. Other ratios can be had by inserting the plugs into other combinations of jacks. Since the lowest ratio arm resistance is 100 ohms, contact and lead resistance can be as high as 0.01 before an error of 0.01% is had from this source. In practice, contact and lead resistance is much less than 0.01 ohm. In this case, the standard resistance consists of nine coils, each 0.001 ohm, plus a calibrated bar 0.0011. These resistances are accurate to 0.02%. The nine coils in conjunction with the calibrated bar have the effect of a bar 10 times as long. Nine coils can carry a current of 50 amperes continuously and the bar alone can carry 150 amperes. The bar is calibrated to 100 divisions, and a vernier screw allows readings down to 0.1 division. Range of this Kelvin bridge is from 0.000,000,011 to 1 ohm, with an accuracy of 0.04%. A portable Kelvin bridge is diagrammed in Fig. 7. This is the Leeds & Northrup type 4286 Kelvin bridge ohmmeter. The portable bridge compares the unknown resistance against 5 standard resistances by means of a dual ratio arm that is variable. Resistance of the unknown is equal to the dial setting of the ratio arms multiplied by the standard in use, with the dial calibrated 0.01 to 0.11 ohms. The range of the portable bridge is from 0.0001 ohm to 11 ohms, and the error is less than 2% of the setting. Fig.7. - Diagram of Leeds & Northrup portable type 4286 Kelvin bridge ohmmeter. The No.1 Weston ohmmeter uses a D'Arsonval movement, but with a tapped coil. The current through one coil remains constant, while the current through the second section varies with the resistance connected across the meter terminals. Its coils are so wound that when no resistance is in the circuit, the torque of the two coils are equal and the meter reads zero. When a resistance is inserted in the circuit, the current in the "resistance" coil only partially nullifies the current of the "current" coil, causing the meter to read up scale. Provisions are made for adjusting the meter by means of a magnetic shunt to compensate for aging of the battery. A mirror scale is provided and the scale is very close to linear. The megger is an instrument, formerly made in England but since the war manufactured in the United States, that is used primarily to measure insulation resistance. The instrument consists of a dual (current and voltage) coil, shaped like a T, rotating in the field of a permanent magnet. No springs are used in the instrument. The magnet also supplies the field for a small d.c. generator with a potential of 500 volts, which is operated by rotating a hand crank. In operation the crank is rotated and the 500 volts generated is applied to the voltage coil, turning the coil so that the pointer appears at the "infinity" mark on the scale. 500 volts is also applied to the resistance (insulation) through the current coil. The torque produced by the current passing through the current coil and the insulation resistance, opposes the torque of the voltage coil, causing the pointer to swing away from the infinity mark to a point on the scale corresponding to the resistance being measured. A "megger" finds its chief use in measuring insulation resistance where a source of power cannot be had. The range of this instrument is usually 100 megohms and 500 volts. Special instruments can be had to measure resistance up to 20,000 megohms at a test potential of 2500 volts. A special resistance meter recently designed by the writer is worth describing. It operates on the bridge principle, but in place of a null indicating meter, the meter is calibrated from 1 to 10. The range of the instrument is from 0.1 ohm to 10 megohms in decade steps - i.e., 0.1 ohm to 1 ohm, 1 to 10 ohms, 10 ohms to 100 ohms, etc. With a meter scale of 90 divisions, each division represents 1% of full scale. The meter can be read with ease to 1/4 division or 25% of full scale. The meter has been built in several ways. It has been used as a limit bridge, a temperature bridge, and a resistance meter. As a limit bridge it has been made as sensitive as ± 0.1% of the standard in use. As a resistance meter it has replaced a regular bridge, since it is speedier in operation; resistances are measured as quickly as in a conventional ohmmeter, but with the accuracy of a bridge. Methods other than outlined above have been occasionally used in resistance measurements. However, they are not as common and are seldom used.